A gangmaster who left 21 cockle pickers to drown in rising tides at Morecambe Bay has been jailed for 14 years. Chinese-born Lin Liang Ren, 29, from Liverpool, was convicted at Preston Crown Court of manslaughter. The gangmaster, girlfriend Zhao Xiao Qing and cousin Lin Mu Yong were also convicted of facilitation - helping cocklers to break immigration laws. 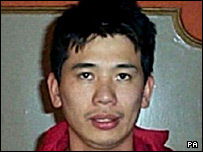 Lin Mu Yong, 31, was sentenced to four years and nine months. Zhao Xiao Qing, 21, got two years and nine months. When they have served their sentences the Home Office will have to decide whether or not to deport the trio. Passing sentence on Tuesday, Mr Justice Henriques said Lin Liang Ren had "cynically and callously" exploited his countrymen and women and provided them with dreadful living conditions. He said the gangmaster had been motivated by avarice and displayed little regard for the safety of the cocklers. He described how Lin Liang Ren had waited 50 minutes before alerting the authorities to the impending disaster. He said: "Had you even then decided to evacuate the beach, there might have been no loss of life." Lin Liang Ren had also told a series of "spectacular lies" to authorities in a bid to evade justice and displayed complete indifference to the fate of the victims, the judge said. He had attempted to blame everyone but himself for the deaths of the illegal Chinese workers. Mr Justice Henriques sentenced Lin Liang Ren to 12 years for the manslaughter charges and six years for the facilitation charges, which he ordered should run concurrently. He jailed Lin Liang Ren for a further two years for the charges of conspiracy to pervert the course of justice, saying these should run consecutively. Zhao Xiao Qing was sentenced for one count of facilitation and three counts of perverting the course of justice. The judge said that he had rarely heard a more "contrived, deliberate and extended series of lies" from a defendant. At least 21 people died off Hest Bank on 5 February 2004. The bodies of two others were not found. Speaking after the hearing, Det Supt Mick Gradwell, who led the Lancashire Police investigation, said the force was pleased with the sentences. "I think they reflect the seriousness of the offences and I'm hoping they will act as a deterrent to other people," said Mr Gradwell. "I hope lessons have been learned but it's not about just cockle pickers, it's the whole issue of illegal immigration. "It's a truly awful type of slave trade, exploiting people in this way," he added. Outside court, ex-councillor Patricia England said there was an "element of racism" about the fact all three Chinese defendants were convicted. There were also accusations of racism over the fact the two English defendants had been acquitted. Ms England said: "There is an element of racism here, justice here is more from our point of view, from our situation and our society, not from theirs." Gina Tam, translating on behalf of the brother of Lin Mu Yong, said the three defendants had been made "scapegoats". She said: "I think the Government is responsible, they knew they were there. "This looks like a racist system to me - the three Chinese all guilty."